"Seven more farmers committed suicide yesterday," my brother said during our weekly phone check-in. A civil engineer who travels around the rural Vidarbha region, the bread basket of my native state of Maharashtra, he daily witnesses the ravages of the epidemic of suicide, which he first reported to me half a decade ago, long before the American press even acknowledged it. The statistics are sketchy, but India's National Crime Records Bureau estimates that between 1995 and 2007, 184,000 farmers committed suicide, a large per centage of them in Maharashtra. The rate of suicides also accelerated in the new millennium. By some estimates, a farmer in India commits suicide every 30 minutes. Ironically, the suicides are happening not in some tribal backwater, but in one of India's most prominent states, with its capital in Mumbai, home to India's biggest stock exchanges and domicile of 21 of India's 51 billionaires, not to mention 100,000 millionaires. When 180 people became victims of a terrorist attack there in November last year, the world paid attention, but the 4,000 suicides that took place in the same year got little international media coverage. Thanks to globalisation, Vidarbha's farmers now compete in the world market. Under pressure to plant cash crops, they purchase Monsanto's genetically modified Bt cotton seeds. Native and hybrid varieties are no longer available. The new seeds require huge amounts of water and pesticides, raising production costs and entrenching the farmers deeper in debt. Then the monsoons fail to arrive, un-seasonally hot and humid weather continues well into autumn, and crops wilt away -- like this year. Read on. . . 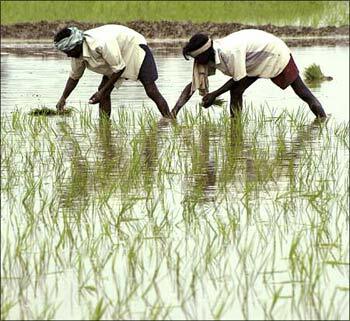 Image: Farmers working in a paddy field. What little harvest is produced cannot compete against huge subsidies received by American and Western agriculture. Unable to pay their debts, Indian farmers commit suicide. 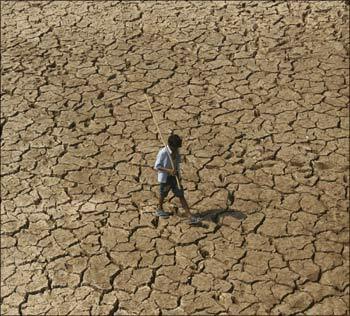 Climate change in the Vidarbha region has made this scenario repeat itself year after year. Global warming here is not an academic possibility, but a reality. As early as 2002, I was surprised by a sudden winter rainstorm in my hometown of Nagpur. In a place where monsoons used to arrive like clockwork June 7 every year, the rains were coming later and later -- or not at all. To a person who had been away for 30 years, the changes were startling. These are not just old wives' tales; the Nobel Prize-winning Intergovernmental Panel on Climate Change has noted deaths resulting from extreme heat waves in India in recent years and the ferocious intensity of the monsoons once they do arrive, causing floods and other damage. In the meantime, the United States, one of the top emitters of carbon dioxide, has failed to sign the Kyoto treaty. The picture is so grim, some Indian activists believe that the blood of our farmers is on the hands of US politicians and corporate chief executive officers. The US owes reparations for the lives of perished farmers, they say. The proposed climate bill in US Congress, which has been supported by President Barack Obama, aims to reduce carbon dioxide emissions to 1990 levels by 2020 and to 80 per cent below 1990 levels by 2050. This sounds impressive, until you look at the actual figures. In 1990, the US emitted about 5,000 metric tons of CO2 or about 20 tonnes per person. In 2006, its emissions increased by 10 per cent to almost 6,000 tonnes, or 20 tonnes per person. So, even if the US reaches its target of 1990 levels, its per capita emission will still be among the highest in the world, about 15 tonnes per person. India, in contrast, emits 1 tonne, and China 4.5 tonnes per capita. The argument that America is highly industrialised and therefore cannot reduce its emissions does not hold much water, since developed nations like Germany, the United Kingdom, and Japan have about half the per capita emissions of the US. France emits 6.6 tonnes per person. Canada and Australia emit almost the same amount per capita as the US. It is obvious therefore that emissions or their reductions have more to do with the national will or lack thereof than with economic affluence. To avoid an increase in earth's temperature of more than 2 degrees Celsius, which, scientists agree, will cause irreversible damage to our planet, we need to reduce carbon concentrations in the atmosphere from the current level of 385 parts per million to 350 parts per million. 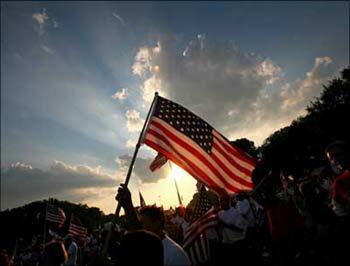 Image: Americans wave the US flag at a rally. For this, the US will need to reduce its carbon emissions to a level 40 per cent below 1990 by 2020. This is exactly the level that India has demanded from the US as well. What does this mean per capita? About 9 tonnes per person, which is still very high. Sadly, the upcoming Copenhagen Summit does not offer much hope for a drastic change in America's stance. In the best scenario, the US will agree to no more than 20 per cent below 1990 levels of emissions by 2020. And right-wing politicians in the US will continue to scapegoat India and China as the major culprits. The truth is, Washington has been sold to the highest bidders like the coal and petroleum lobbies. This became ever so obvious when the proposed cap and trade legislation in Congress grandfathered emissions from coal plants so that they would have no incentive to switch to alternative fuels like solar and wind. Many experts believe this legislation does not do anything because the cap is set so high that companies are simply able to sell their pollutions to other companies. What is needed, they say, is a limit on total carbon emissions and fines for exceeding limits. 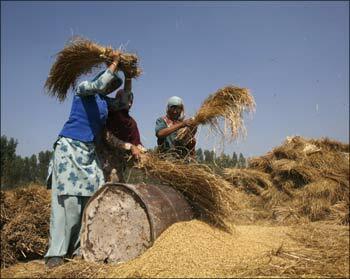 Image: Indian farmers have been hit hard by globalisation. While Washington remains paralysed by interest group politics, billions in India stand to bear the brunt of global climate change, which is certain to result in food shortages, lack of potable water for a majority of the population, flooding of the Ganga and other rivers due to melting glaciers, and an unsustainable exodus of millions from the countryside to the urban centers. One proposal being considered for the Copenhagen Summit holds promise. It insists that the international community agree on a total planetary limit of between 1 and 1.5 tonne per capita carbon emissions per year by 2050, the very level at which India currently stands. And it proposes a World Climate Bank, a trading system for emissions in which developed countries will purchase pollution credits from developing nations. The advantage of this system, unlike the US climate law, is that it will have low enough caps to actually reduce carbon instead of passing it around. And its revenues will be used by countries like India to develop their green economies. To make this proposal a reality, we need to start voicing our support for it now. Indians at home and abroad need to use their intellect, organisation, financial muscle, and media suave to mobilise international opinion. We need to pressure (US President) Obama and other world leaders to sign on to this enlightened scheme. Or face the prospect of losing our planet. If we fail to act now, the blood of our farmers will be on our hands too. The author is an Albany, California-based freelance journalist and writer. 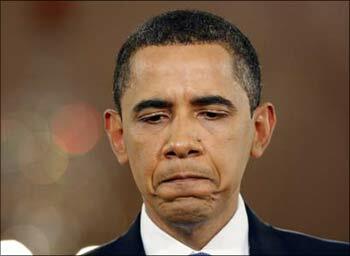 Image: US President Barack Obama.